It’s a whiteboard that lets you project PC screen images onto it, and lets you operate the PC right from the board surface. This contributes to smooth, easy-to-understand presentations and is ideal for meetings in which Websites are displayed, motion images are shown, and additional information is written while meeting. The Panasonic UB-T880W Multi-touch Interactive Whiteboard is an advanced tool that redefines how you interact with meeting participants. The UB-T880W/UB-T880 uses a projector to display PC images onto its surface and lets the presenter operate the data on the board with a finger or an Electronic Pen that works like a PC mouse. It allows you to create interactive, eye-catching material. The UB-T880 is designed with the emphasis on operating the PC from the board surface. Intuitive operation lets you freely manipulate music, movies and images, to change ordinary meetings and presentations into visually active exchanges. It adds an exciting visual element to meetings that used to be all talk and few pictures, and brings rich, paperless expression to presentations that previously depended on stacks of paper handouts. It also comes with original software that makes it easy to prepare documents. The UB-T880 can accept a variety of multi-touch gestures using either your fingers or an electronic pen. Scale, zoom and pan images using your hands and fingers for the ultimate interactive experience. Up to three people can work simultaneously on the board for collaborative group work. 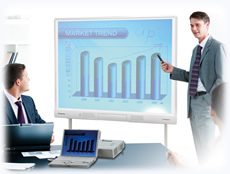 Like more interactive whiteboards from Panasonic, this interactive whiteboard allows you enter text or data directly into any word processor or spread sheet software using the elite Panaboard Software. The unit also comes with built-in speakers. A multifunctional electronic pen acts as a pointer, multi-colored marker, eraser and PowerPoint slide controller. An optional Wireless Kit allows you to connect the interactive whiteboard with your computer without any cables. On-board USB ports allow you to connect additional devices with the interactive whiteboard.